Access All Areas members have a great new premium resource to download this week courtesy of Gearwright. 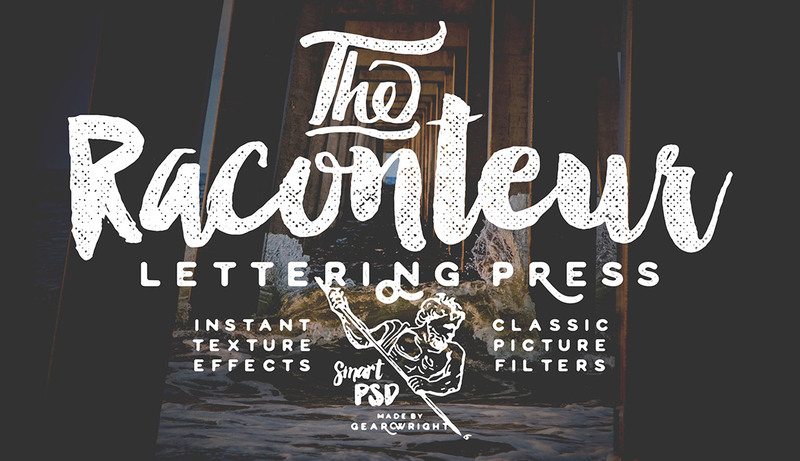 Raconteur Lettering Press is a smart PSD that transforms your lettering & typography pieces into rusty hammered illustrations. It contains 39 handcrafted textures, including halftone, bottled ink, rolled ink, and grunge that immediately weather your typography to produce aged effects. This is combined with a collection of 9 useful classic picture filters to give your background photo a vintage crafty feel. Gearwright is home to Yusof Mining, a toolmaker who supplies creative resources to designers worldwide. The Gearwright store is packed full of quality products that help you produce beautiful vintage themed effects though fonts and Smart PSDs. If you’re a fan of classic printing and handcrafted styles, Gearwright resources allow you to reproduce these effects with authenticity in seconds! Access All Areas members can download the full Raconteur Lettering Press as part of their membership. This single smart PSD is an all-in-one kit that gives you a range of options to transform your artwork with a grungy vintage style. Choose from 39 textures readily set in the press to rough up your illustration or typography, then select a background photo and apply a complementary filter to produce a trendy design. Oh, wow! Nice! Thank you, Yusof ! Thank you, Chris!